In France, lamb brains — known there as cervelles — are a prized ingredient in a number of gourmet dishes. They are most often deep-fried or sauteed in butter which adds to the high fat content of lamb brains. Even braising lamb brains does not alter the exceedingly large amount of cholesterol they contain. Although a 3-oz serving of braised lamb brains offers generous amounts of vitamin B-12 and omega-3 fatty acids, the cholesterol content of 579 percent of the daily value overshadows those healthy nutritional benefits. A 3-ounce serving of braised lamb brains contains 123 calories, and about 40 of these calories are supplied by 10.6 grams of protein. For an adult man over 19 years old, this amount would supply 19 percent of his recommended dietary allowance of protein per day; for a woman of the same age, it would fulfill 23 percent of her recommended daily protein intake. Because lamb brains are dense in protein but have no carbohydrates, they can be included in even the most restrictive low-carbohydrate diets. Braised lamb brains contain 8.6 grams of total fat and 2.2 grams of saturated fat in a 3-ounce serving. The American Heart Association says you should get 7 percent or less of your total daily calories from saturated fat. A serving of lamb brains fills over 14 percent of this recommendation for an adult who consumes 2,000 calories each day. The AHA also advises limiting yourself to 300 milligrams of cholesterol daily, or 200 milligrams if you have heart disease or elevated cholesterol. Lamb brains contain 1,737 milligrams per serving. You may want to avoid eating lamb brains if you have a history of cardiovascular problems or talk to your doctor to see if it's OK for you to eat. Read More: Is There a Link Between Cholesterol & Heartburn? Lamb brains are an excellent source of omega 3 fatty acids with 629 mg per 3-oz serving. This represents 39 percent daily value. Omega-3 is an essential polyunsaturated fat, meaning that the body cannot make it and needs to obtain the fatty acid from food. Omega 3 fats play a vital role in many body processes, including helping to regulate the function of cells and membranes, hormones and the immune system. While lambs brain is an excellent source of omega-3s, the saturated fat and cholesterol content may not make it the best choice for getting this health-promoting nutrient. Adult men and women should have 2.4 micrograms of vitamin B-12 every day to support nervous system health and to decrease the risk of heart disease and age-related macular degeneration. 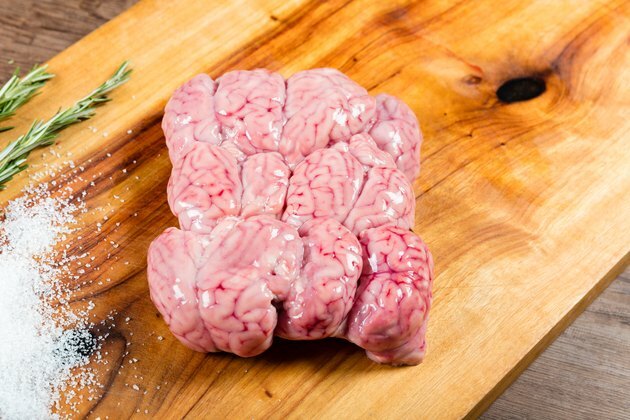 Lamb brains contain more than 100 percent of this requirement, with almost 8 micrograms of vitamin B-12 in a 3-ounce serving. Lamb brains are also a good source of other B vitamins such as pantothenic acid, riboflavin and niacin. A 3-ounce serving of braised lamb brains has 178 micrograms of copper, or nearly 20 percent of the 900-microgram RDA of the mineral recommended for healthy adults. Lamb brains also contain 10.2 micrograms of selenium per serving, which supplies 18.5 percent of an adult's daily requirement. Both copper and selenium act as antioxidants that help your immune system function properly and may help prevent heart disease or cancer. A serving of lamb brains provides smaller amounts of iron, zinc and potassium. Monterey County Weekly: Brains, Kidneys, Liver and Intestines -- They're Culinary Delicacies All Over the World. So Why Don't Americans Get It?